Blood plums get their name from their rich red coloured flesh. Their skin is a deep red, and is usually covered in tiny green speckles. Blood plums are soft and juicy in texture, with a sweet flavour. Available between December and May, they’re good for cooking or eating. Used in fruit salads, pies, cakes, muffins and crumbles. Calories: 36.30 Water: 56.23 g Protein: 0.52 g Carbohydrate: 9 gm Dietary fiber: 0.99 g Calcium: 2. 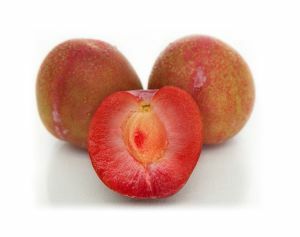 64 mg Potassium: 113.52 mg Plums are high in carbohydrates, low in fat and low in calories. Plums are an excellent source of vitamin A, calcium, magnesium, phosphorus, copper, manganese, iron, potassium and fiber. Plums are free of sodium and cholesterol. Like all fruit plums contain a substantial amount of vitamin C. It has vitamin A, vitamin K and vitamin C. The fruit also has niacin, riboflavin and thiamin. Plums also have pantothenic acid, folate, vitamin B6 and vitamin E.
Total antioxidant strength of plums measured in terms of ORAC (Oxygen radical absorbance capacity) is 6259 µmol TE/100 g. Fresh berries are a moderate source of vitamin C, which is also a powerful natural antioxidant. Consumption of foods rich in vitamin C helps the body develop resistance against infectious agents, counter inflammation and scavenge harmful free radicals. Fresh plums, especially yellow Mirabelle type, are a moderate source of vitamin A and beta carotene. Vitamin A is essential for good eye sight. It is also required for maintaining healthy mucus membranes and skin. Consumption of natural fruits rich in vitamin A has found to protect from lung and oral cavity cancers. The fruit is also good in health promoting flavonoid poly phenolic antioxidants such as lutein, cryptoxanthin and zea-xanthin in significant amounts. These compounds help act as scavengers against oxygen-derived free radicals and reactive oxygen species (ROS) that play a role in aging and various disease processes. Zea-xanthin, an important dietary carotenoid selectively absorbed into the retinal macula lutea where it is thought to provide antioxidant and protective UV light-filtering functions. In addition, the berries are moderate sources in B-complex groups of vitamins such as niacin, vitamin B-6 and pantothenic acid. These vitamins are acting as cofactors help the body metabolize carbohydrates, proteins and fats. They also provide about 5% RDA levels of vitamin K. Vitamin K is essential for many clotting factors function in the blood as well as in bone metabolism and help reduce Alzheimer's disease in the elderly.